Documents need to be sent to your unique Scan my Bills email for the corresponding Cashmanager RURAL farm business. File types that are accepted are PDF, JPEG and TIFF. To send a document from a paper copy, use a scanner to scan the paper version of your bills and save them onto your PC or use an app like Genius Scan to scan a paper version on your phone. Then create a new email message to your Scan my Bills email address and attach the scanned documents. TIP: You can attach multiple documents to the same email message. 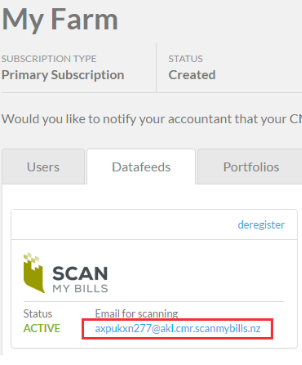 If you receive bills to your own email account, you can forward them to your Scan my Bills email address. We don't recommend that you ask suppliers to email the bill to your Scan my Bills email address as you won't be able to access this account. Instead, we suggest they continue to send any bills directly to you to check. Where can I find my Scan my Bills email address? NOTE: You can't access your Scan my Bills email account; it is only used for sending documents.